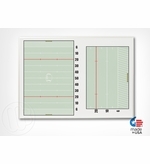 32" x 45" framed locker room dry erase sport boards. 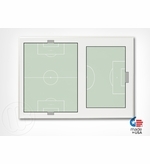 Wall mounted dry erase boards created for coaches and locker rooms. 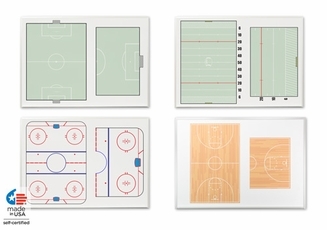 We've created a unique line of dry erase boards with different sport themes on them. 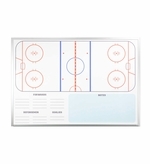 Our larger, wall mounted, dry erase locker room boards help coaches and trainers describe plays and plan strategies clearly to every player. We offer both a magnetic receptive and a more economical non-magnetic receptive format. Magnetic receptive boards can accept magnets where the non-magnetic can't. Both have the exact same excellent dry erase writing surface but if you have no intention of ever using magnets or magnetic accessories on the board why pay for it? Whether you select magnetic or non-magnetic, our exclusive dry erase writing surface is phenomenal. The writing surface is highly ghost resistant and erases clean every time. Our OptiMA sport dry erase boards are created with our exclusive Opti-Print method. You won't find more crisp lines and vibrant colors anywhere on the market and the prints are fully protected with a 5 year warranty against manufacturer's defects. Don't see your sport or want an even larger sized board? Maybe your team logo imprinted on the center court or mid field. We can do that! All products shown are Made in the U.S.A.
Non-Magnetic basketball boards with the same great writing surface. 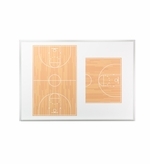 Wall mounted magnetic dry erase board with full court and half court basketball image.